Each and every player who plays in the IPL puts his best foot forward to perform to the best of his ability. However, not every player gets the desired result in every outing. For a player to have a bad day on the field in such a long tournament is natural. Moreover, T20 cricket is extremely cruel for the bowlers. If the bowlers err in their line or length, they are bound to get a beating from the opposition batsmen. Also, because of the class of the batsmen who feature in the IPL, even good bowlers go for a lot of runs when a batsman like Virat Kohli or Chris Gayle is on song. There are a lot of bowlers who have been taken for plenty in the IPL. Here is the list of 9 bowlers who have conceded the most runs in a match in the history of IPL. (Note: The list initially consisted of 10 bowlers but as many as 8 players were tied at the 10th position. RP Singh, Siddharth Trivedi, Parwinder Awana, Abu Nechim, Imran Tahir, Kagiso Rabada, Pat Cummins and Umesh Yadav have all conceded 59 runs in an innings in the IPL). In the 3 seasons that Ryan McLaren featured in the IPL, he played for three different franchises. The South African all-rounder played for Mumbai Indians in 2010 and then for Kings XI Punjab in 2011. 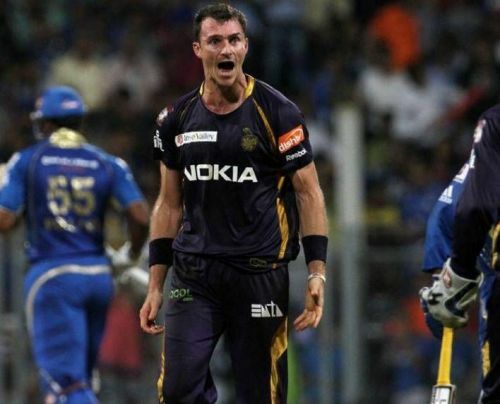 However, it was during the time he played for Kolkata Knight Riders that he was taken apart by his former Mumbai Indians teammates. Even though he took 2 crucial wickets, McLaren gave away 60 runs in his 4 overs. Mumbai Indians scored 170 runs in their innings and won the match by 65 runs.